How musical is a howitzer? THE drums roll like mortar fire, then bass notes rip the hazy sweet mary-jane air like thunderbolts from the hand of an angry Zeus. Crash, crash, crunch, thwannnnnnnnnng come the guitars. The four-man British rock group Slade are on stage at Centennial Hall before a full Sunday night house, conducting mass psychotherapy with the primal screams and towers of amplifiers that have made them consistent concert and recording favourites in Britain. Slade is about as subtle as a division of Sherman tanks, blasting away simplistically at top volume as lead singer Noddy Holder screeches "Mama Weer All Craaaaazeeee Now" as only an amplified megaphone can do. The Slade formula for hit single after hit single in dear old England is this: Turn it up, keep it up, write for people who can't understand words and don't make anything too long. This is getting one's kicks at its earbusting chest twitching best - or worst. As for the musical and lyrical value of all this, well, how musical is a howitzer and how poetic is a gut wrenching scream? So far, North America hasn't been slayed by Slade, though their reputation is big enough to sell out Centennial and still attract a small crowd outside the building who stayed to hear them through the concrete walls and airspace of a corridor that seperates the hall audience from civic square. Slade started their climb to success when the band shaved their heads and became the favourites of skinheads, the British toughs of a couple of years back who went around beating up on Pakistanis and other ethnic groups. That sort of action had nothing to do with Slade of course, but it gives you some kind of idea what kind of fan they attracted. As their fame grew in Britain, Slade got hip, which means the band members grew their hair long, traded their leathers for the silks and platform shoes of standard rock stars and expanded their appeal to include anyone who has to feel music right through to the bone marrow. The audience for this kind of stuff is still large, as was obviously proved Sunday. The audience was at times tumultuous in its response, evidence that maybe even vicarious primal screaming works. 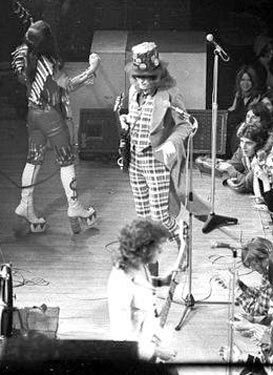 Oh, one interesting novelty that is a Slade trademark - Holder wears a black top hat covered in circular mirrors which sends shafts of reflections dancing crazily all over walls and ceilings when a battery of stage lights pours luminous streams upon his head. Slade was preceded on stage by Seadog, a Canadian band of more subtley and musicianship. Seadog is an ever improving band. My thanks to James Reaney for digging out this review from the archives of The London Free Press and sending me the hard copy!